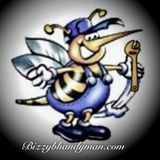 Bizzy B Pro Handyman Services! Want to connect with Terrence? The Right Choice for all your Home Remodeling Needs. Kitchens. Bathrooms. Basements. Decks. Flooring. Windows. Doors. Concrete and cement work. Demolition. Clean outs. Handyman services. Home repair. Handyman. Carpentry. Drywall. Window repair. Door repair. Installation. Toilet repair. Faucet repair. Plumbing repair. Electrical repair. Concrete repair. Stucco repair. Gutter repair. Cleaning. Furniture assembly. Clean outs. Junk removal. Painting. Painter. Electrician. Plumber. Painter. Ceiling repair. Leak repair. Roof repair. Mailbox installation. Deck repair. Power washing. Garbage disposal installation. Washing machine installation. Dryer installation. Dishwasher installation. Light installation. Ceiling fan installation. Recessed lights. Water heater installation. Picture hanging. Flat screen TV mounting. Scrap metal pick up. Tile installation and repair. Grouting. Caulking. Sump pump installation. PVC pipe repair. Chandelier installation. Fence repair.Hinge Replacement. Dimmer switches. 3 way switches. Toilet gasket repairs. Wax ring installation. Cabinet door repair. Rotting wood repair. Shutter installation. Siding repair. Lock change services. Flooring installation. Pergo flooring. Tile flooring. Laminate wood flooring. Linoleum flooring.kitchen cabinets. Bathroom vanity cabinets. Counter tops. Kitchen remodeling. Bathroom remodeling. Finished basements. Garage remodeling. Attic remodeling.